The growing use of smart cylinder technology is arguably the most significant trend in mobile and industrial hydraulics. The Best Metal Products smart cylinder design uses a magnetostrictive-based sensor that senses rod position and generates an output that enables continuous monitoring of the cylinder rod position. The smart cylinder optimizes communication between the machine and the cylinder, so the machine can be programmed to precisely instruct the cylinder what actions to take. The smart cylinder designs offered by Best Metal Products are rugged and specifically engineered for mobile applications. They offer a broad operating temperature range (-40°C to 105°C) and can withstand high impact – up to 100G. The Best Metal smart cylinder design offers absolute position reading that never requires recalibration or re-homing after a power loss. These cylinders accommodate analog and digital outputs, and work with a high visibility LED display. Its non-contact sensing technology eliminates wear, while assuring the greatest durability and output repeatability. Using one electrical connection, minimal wiring and programming are required, and with top of the line sealing capacity, our smart cylinders are long-lasting, regardless of operating conditions. 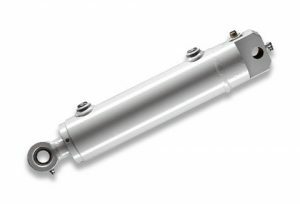 Our smart cylinder design offers a broad range of options, output signals, and probe lengths, and is available in single acting cylinder and double acting cylinder models, with a broad range of hydraulic cylinder mounting options. We’ve combined state-of-the-art technology and value to provide accurate, reliable, and long-lasting smart cylinders for a variety of applications.